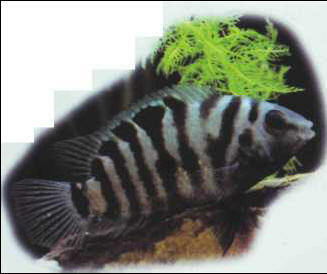 The convict cichlid is a territorial fish which you will often find playing bulldozers in your aquarium! It is best therefore to avoid plants or delicately positioned rockwork. Selective breeding has gradually evolved a xanthochromic (golden) variety, which is just as belligerent. Both strains can interbreed with the redheaded cichlid, but the hybrids inherit the convict's behavior patterns. Size: 15-20 cm. ФИШ-ХУК (Fis Hoek) , пригород г. Кейптаун (ЮАР), где в 1927 найден скелет ископаемого человека современного вида с чертами бушменской расы. Древность св. 10 тыс. лет.